There’s no question that it is sometimes difficult to see the impact our choices have on others. This is certainly the case with farmed animals, who are kept out of sight, generally in remote, rural locations. This distance makes it easy to forget the misery and deprivation animals suffer at factory farms (which is why undercover investigations exposing abuse are so important). In fact, farmed animals are easily the most abused animals on the planet. From the moment they are born, they are subjected to cruelties that few of us can even imagine, including extreme confinement and mutilations without painkillers. But after discovering the horrific abuse faced by billions of animals each year, many people still wonder whether eating vegan food will really make a difference for animals. And the short answer is yes. Each year, the average American consumes around 30 farmed animals. By choosing animal-free foods, we spare these animals a lifetime of neglect and horrific suffering. But that’s just the beginning. Each year, countless sea animals are also killed for human consumption. And they are literally countless, since fish and other marine animals are often measured in pounds, rather than in lives taken. Some researchers argue that the number of animals per pound can be as high as several hundred, since many of these animals, like several species of shrimp, are very small. In addition, every year millions of wild animals, including bears, coyotes, and foxes, are killed because they are perceived as a threat to livestock. In the United States, roughly 2 million wild animals are killed for that reason each year. And it’s not just land animals. According to Whale and Dolphin Conservation, more than 300,000 whales, dolphins, and porpoises die every year as a result of being caught in fishing gear and nets. The commercial fishing industry also kills countless non-target species of fish, turtles, and other marine animals. Animals want to live free from harm just as much as we do. But at factory farms they are subjected to treatment that would be illegal if perpetrated against a dog or cat. By eating vegan, we’re working toward a less violent, more compassionate, and more sustainable world. With millions of vegans around the world, think of how many more we’ll spare together! Your choices do make a difference. Ready to give it a shot? 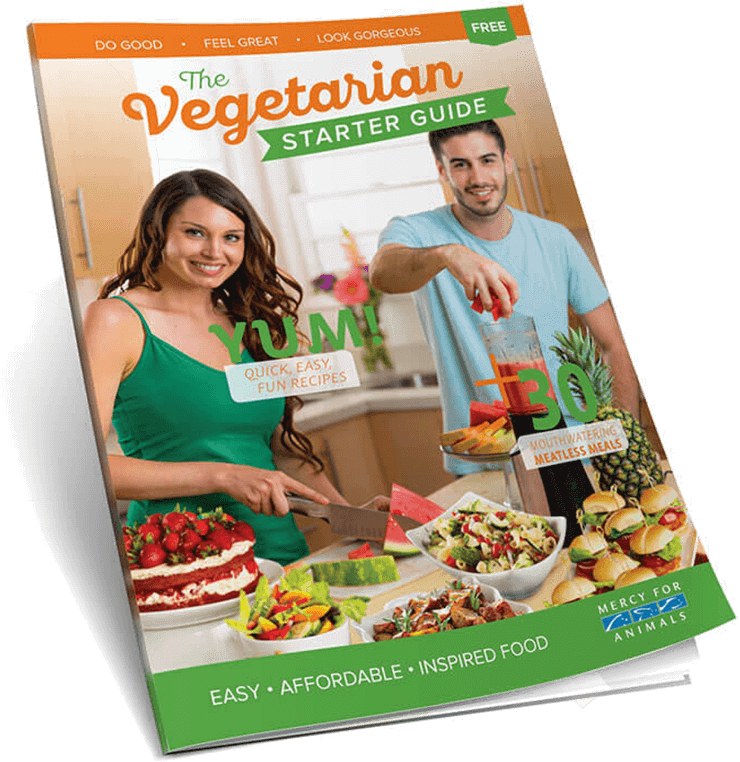 Click here for delicious vegan recipes, easy meal ideas, and tips on making the switch.